This is a followup to my previous blog post. When I was processing the data, I noticed a small nebula in center of the large complex of Sharpless 232. It seems to be the only O-III emission source in this large emission nebula. My O-III exposure was relatively short though, only 2h. The origin of this small ionization zone puzzles me. I made a small animation from integrated emission channels. No other processing, than calibration and simple un linear stretching has been done to the images. One mystery solved with a help from another astroguy. "Saloja" from a Finnish astro group used the Megastar database and found out, that this blue dot is a known planetary nebula, PN G173.5+03.2. Thank you Saloja! Note the blue dot at middle of the photo, it's not a star but a small area of nebula emitting the O-III light. 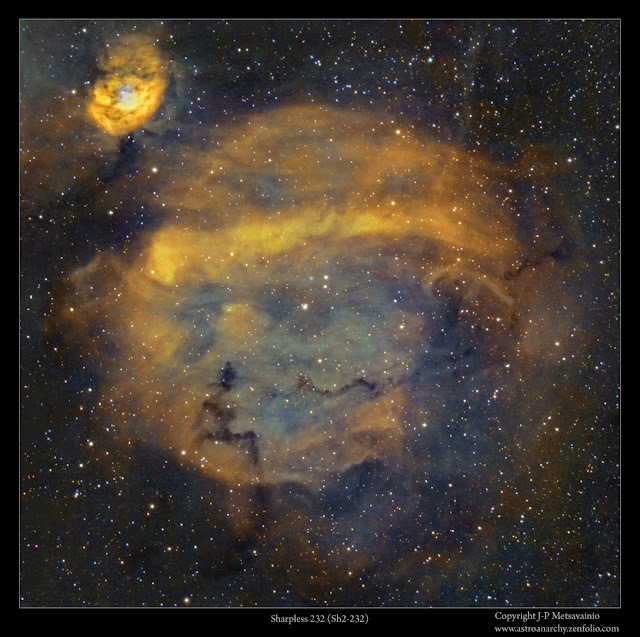 This animated GIF shows all three emission channels imaged for this photo, O-III, S-II and H-alpha. The small nebula is visible in both, H-a and O-III, S-II doesn't show it. It could be nice to understand the mechanism behind this small object. Is it part of the large nebula and what is the energy source for the ionization? It might even be a planetary nebula, part of the large Sh2-232 complex or a separate object front or behind it. Has anyone else noticed this object? Let me know, if you have some info about it. I have animated to this starless version of Sh2-232 photo, what I'm seeing in lower part of the nebula. There is a ring like formation and I'm seeing some hints of the concentric structure too.